What became widely known as the Red Shield work for troops commenced in Australia in a Marquee at Broadmeadows, Vic., in August 1914. Following and interview with the Minister of Defence, Commissioner Hay arranged for a permanent hut, 100 feet long to be erected. It contained writing and cloakrooms, and provided for recreation and refreshments. During 1915-16 similar structures were built in many camps. The words “THE SALVATION ARMY, ” in white letters on a red shield-shaped background, became a well known Insignia, and at the meetings several thousand men found Christ. Several Motor Ambulances were also provided for the Army Medical Corps. In France in 1915, a group of Australian Officers, known officially as National Service Secretaries, built up a wonderful reputation for service in the Australian Red Shield Hostels established at Le Havre by Brigadier (later Commissioner) R. C. Henry. Here for the first time appeared the famous “Hop-In” sign – an arresting painting of a life-like kangaroo, and the words “Hop-In, it’s yours!” It gave the “diggers” a home touch in the foreign land. Lieut-Colonel Isabel Henderson, Brigadiers G. Collins, E Eggleston and M. Lawrence, and Adjutants J. Cant and M Toft, “Bethesda “ Officer Nurses, served with the Australian Army Nursing Service. Early in 1939, Commissioner Henry, then Territorial Commander in Melbourne, conferred with the Defence Administration regarding the Army’s work in the event of the commencement of hostilities. The part to be played by the philanthropic organisations was clearly defined in official memoranda, and an early start made. The first body of troops served by the Red Shield marquees at Trawool, Victoria, was a Victorian Artillery Brigade, under Lieut-Colonel Herring. Adjutant (later) Brigadier and Mrs Trestrail occupied a caravan on the adjoining property. As if by magic, Red Shield Huts appeared in most camps. Major (now Colonel) G. W. Sandells was the first Salvation Army Chaplain appointed to the 2nd A.I.F., and Majors A. E. Albiston, W. Bates, E Pentecost, R. Smith, F Saunders and A. MacCarthy held similar appointments later. 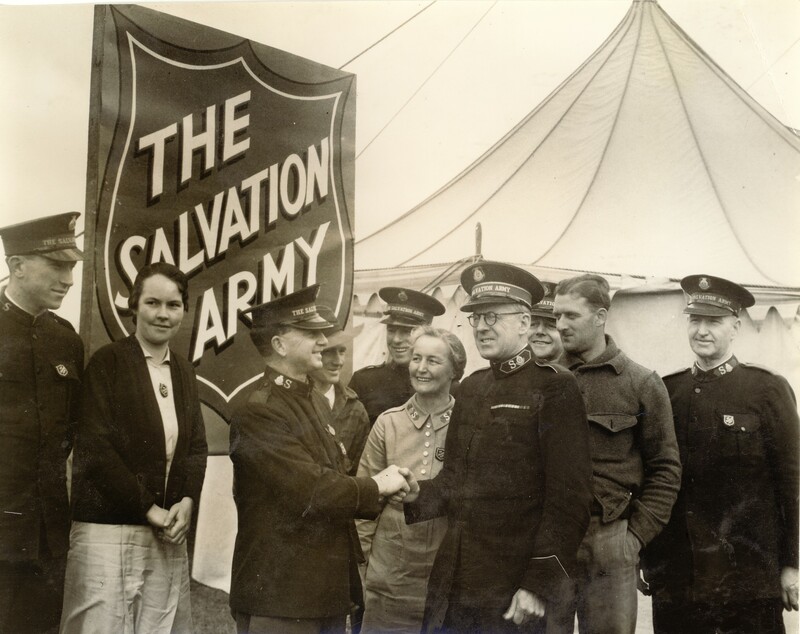 Salvation Army Officers were appointed to Chaplaincy duties with the R.A.A.F. also. When the Royal Australian Air Force Technical Training School was set up at the Melbourne Exhibition Building, a Red Shield Officer was, by request, attached to the staff, and similar appointments to other establishments followed. Red Shield “Units of Service” worked at money raising providing several vehicles and later an aeroplane. Efforts in Maryborough, Vic., resulted in four mobiles being presented, as well as supplies of clothing and comforts. Other towns and organisations gave splendidly equipped mobiles also. Women Salvationists played an important part in the Army’s effort to help service personnel. From the beginning willing workers helped with sewing in reception camps where troops were being outfitted. Women Field Officers assisting in Training Camps with refreshments, knitters providing woollen comforts for the troops and garments for bombed victims overseas. Red Shield House in Little Bourke Street, a large three storied structure, was opened in early 1940, and the Red Shield Club in a huge remodelled hire garage adjoining. During the succeeding five years 500,000 men of all branches of the Military Forces, the Navy, Air Force and merchant Marine, received hospitality when on leave, groups of voluntary workers assisting throughout. The establishing of leave and other Hostels for Service-Women was an important part of this service. In Melbourne The Salvation Army Women’s Hostel was made available for women of the services and renamed “Spring House”. “Heathfield”, “Toorak”, and “The Lodge”, in Toorak Road were also fitted out as hostels. These were conducted by women Salvationists. Scores of others, helped in the thirty four hostels in hospital visitation and with clerical duties. Several Officer Nurses from our “Bethesda” Hospital took up appointments with the Australian Army Nursing Service, and over a period of six years rendered service in the various theatres of war. When a portion of the 2nd A.I.F. left Australia for the Middle East in 1940, two Red Shield Representatives accompanied the Force, and before long with the assistance of other Officers and Corporals appointed as hut orderlies, twenty seven of the thirty two training areas in Palestine were being serviced. Motor Mobile Canteens, complete with 30 gallon water tanks and a ten gallon tea infuser or thermos urn, were essential parts of the equipment. Moving rapidly from place to place, the Officers conducted Church Parades, held sing-songs, organised concerts and radio programs and had countless personal conversations on the power of God to save. In the first push through Libya four mobiles accompanied the troops having their first experience in battle. The units were set going in the desert, by the roadside, in gullies, in buildings and tents, in rain, sunshine, moonlight and blackout. 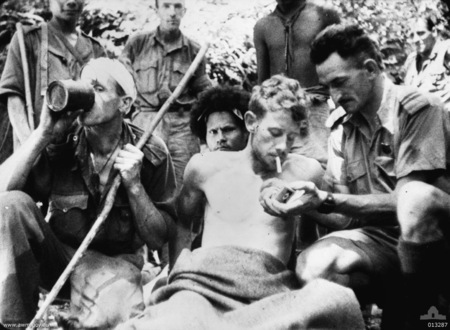 Hot coffee was provided for wounded, guards, doctors, hospital staff, ambulance drivers, prisoners and sent to the front lines. The men worked under varying conditions. 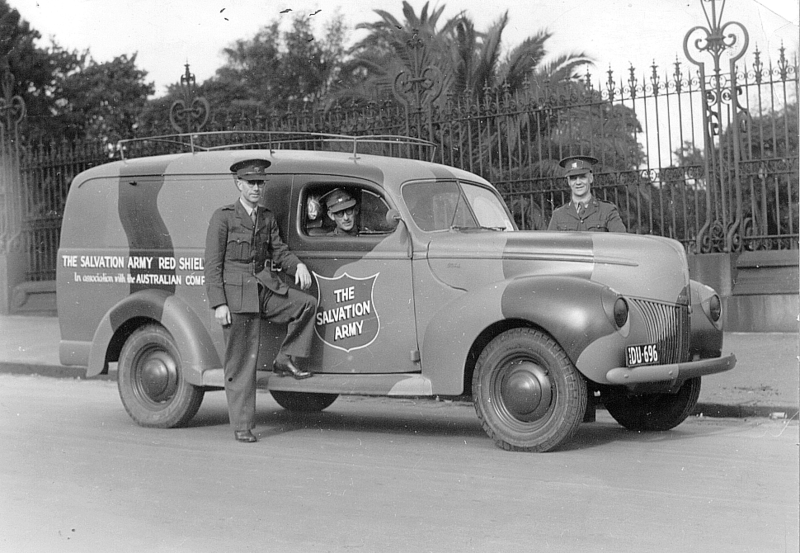 After Pearl Harbour, Australian troops were committed to the defence of the Pacific islands, and The salvation Army was there too. Serving on the Kokoda Trail, on Borneo and other theatres of the Pacific war, Salvation Army Red Shield Representatives faced all of the rigours and hardships of jaungle warfare with the diggers. 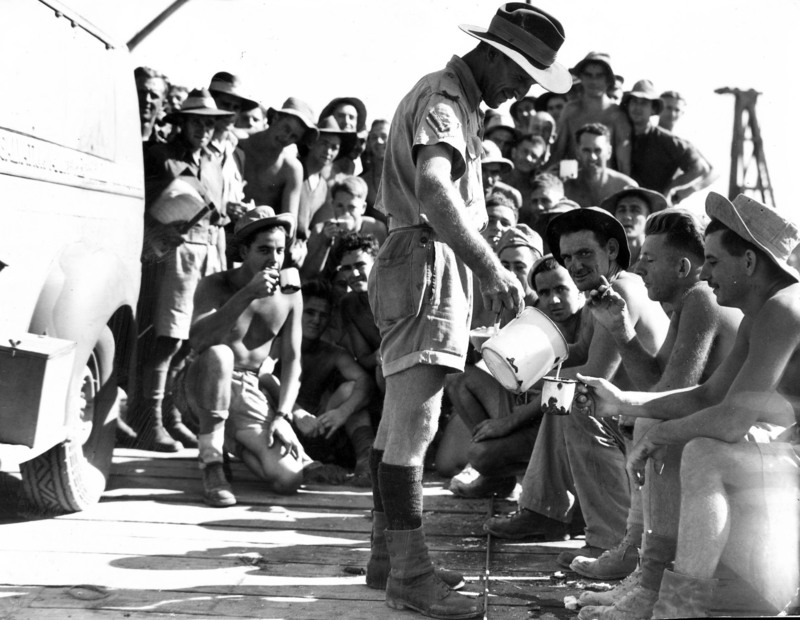 With the occupation of Japan at the end of World war 2, Australian troops were a part of the occupation forces, and they too enjoyed the support and encouragement of Salvation Army representatives in the Red Shield Defence Services. 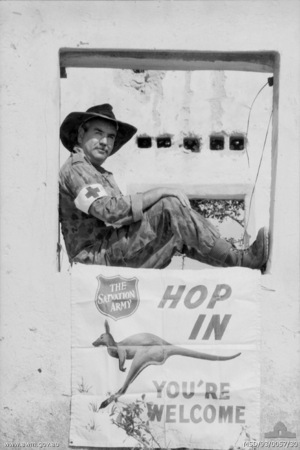 In the 1950’s the Korean War took Australian troops into active service once again, and Salvation Army Hop-In Centres were an important part of the high morale of our troops serving in the wintry conditions in Korea. Then came Vietnam. Once again, Australian troops faced the heat of the battle, and along with them went the Red Shield Defence Services men. In recent years we have supported our troops in deployments in Cambodia, Somalia, East Timor and the Solomon Islands. In peace time Salvation Army Red Shield Defence Services representatives can be found at Puckapunyal, Royal Military College Duntroon, Holsworthy, Singleton, Enoggera Barracks, Amberley, Lavarack Barracks Townsville and Robertson Barracks Darwin. Where there’s a need, there’s The Salvation Army. As “The Army that serves on every front”, The Salvation Army Red Shield Defence Services is there at all times to support our troops as they risk their lives in the line of duty.